Grown for the attractive upright stems, Euphorbia trigona is commonly called the African Milk Tree, the name comes from the sappy stems. The sap is a skin irritant so wear gloves when handling. It is grown as an indoor plant, and in a container growth rate is slow, however over time it can reach 2 metres (6ft) on height. Its upright growth habit makes it look a little like a cactus and it does look great when grown in containers. Originally from Namibia and nearby areas, this succulent is a desert dweller, and it is a drought tolerant plant. It does require a well drained soil, so a cactus and succulent potting mix is ideal for container growing. Being drought tolerant, does not mean no water at all, and this is especially true when growing in containers and indoors. Check the soil for moisture, and when the top 5 cms (2 inches) feels dry water. Do not water agin until the soil feels dry again. You can simply push your finger into the soil to test the moisture. When grown outdoors, once established, the occasional deep soaking during long dry periods will be all that is needed. In the garden, Euphorbia Trigona will need little to no fertiliser at all. In containers, a monthly application of a general purpose fertiliser at 1/4 strength will be adequate. Do not fertilise at all during winter. Generally not required except for the removal of any dead growth. Flower – Very small yellow flowers along the stem ridges. Although the plant very rarely flowers in cultivation. 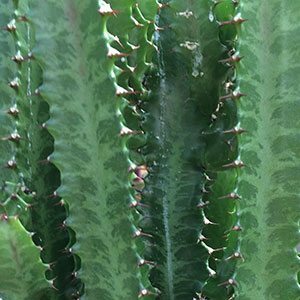 Poisonous – Yes, the sap or latex from the stems of Euphorbia trigona is both poisonous if ingested and also a skin and eye irritant to cats, dogs and humans. From seed, or by stem cuttings. A stem can be removed at the base with a sharp knife. It need to be left to callus over for a few days to lesson the chances of rotting. The cutting is then planted directly into a cactus and succulent potting mix. Keep the soil moist for a 4 – 6 weeks. Keep the cutting in light shade. Euphorbia Trigona rubra (royal red) is a variety with red leaves.